The Great Wolf Lodge offers fun themed suites but even their standard suites (which we stayed in) are really nice! We stayed in one of their standard family suites which came with 2 soft queen sized beds, with a separated seating area and small table. The TV was set up on a rotating stand so you could position it to watch from the beds or the seating area. Our suite also included a full bath, Free High-speed Internet, Microwave, Mini fridge (with 2 complementary bottles of water), a coffee maker, a hair dryer, and decent sized garbage cans. All of these amenities really made our stay comfortable. At check-in I was given a small packet with the information for the premium services they offer, like their fun family restaurant, stores, arcade, gym and Magic Quest as well as the hours for the many Free amenities included in with your stay like the water park and all the free kid activities, and character meet up opportunities provided throughout the day. I was surprised by how much is actually included in your stay. 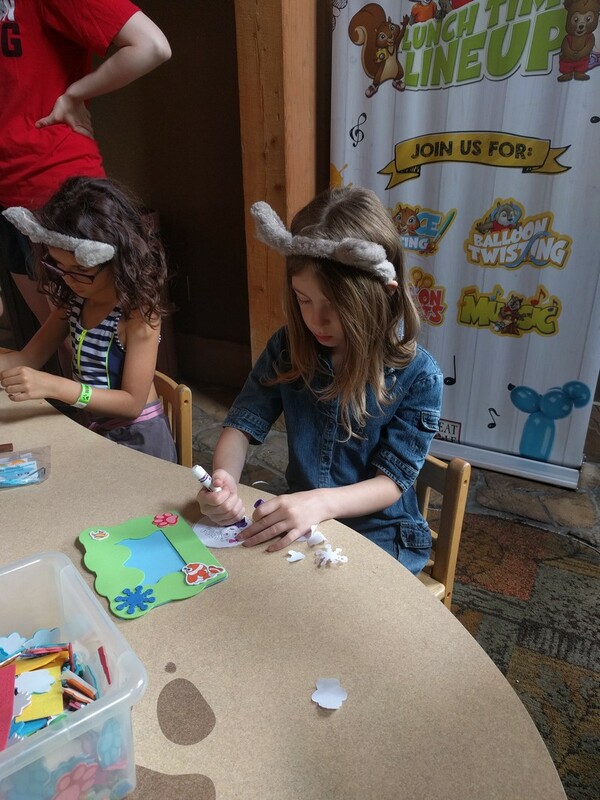 Each Morning, Afternoon, and Evening they had free kids crafts and activities available. All you had to do was bring your children to the main lobby. 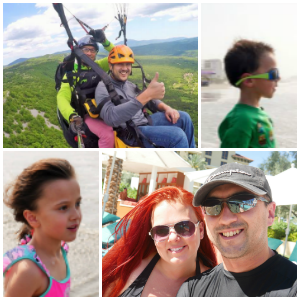 During our stay our kids got to make and decorate picture frames, buttons, and foam airplanes. They had custom balloon animals (or swords in my boys case) made for them, played BINGO, participated in the evening pajama dance party and story time, met 2 of their fun characters and watched the great clock tower show. 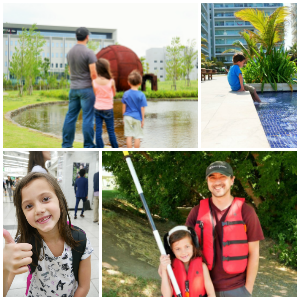 These free activities were great ways to fill in the down time when we weren’t spending time in the city or enjoying the amazing Water Park at the Lodge. They had a swimming pool with basketball hoops and even a fun little obstacle course. My boys had fun having their dad lift them in the air so they could make slam dunks with their balls and my daughter did the obstacle course at least 5 times. Next to the swimming pool and obstacle course was a massive tree house water fort with bridges, toys, kid activated water features and slides. On top of the water fort was a huge bucket that was constantly filled with water and then dumped on the people in the fort below each time the bell rang. Behind the water fort was a lazy river you could float down in a tube as well as a few really fun water slides (that you could ride alone or with someone on their double and triple person tubes. **They also had nice cabanas you could rent and a fun outdoor activity pool area. On our last morning there we had to check out their fun candy store, and arcade area that we hadn’t had time to visit earlier in our stay. They kids really enjoyed that. 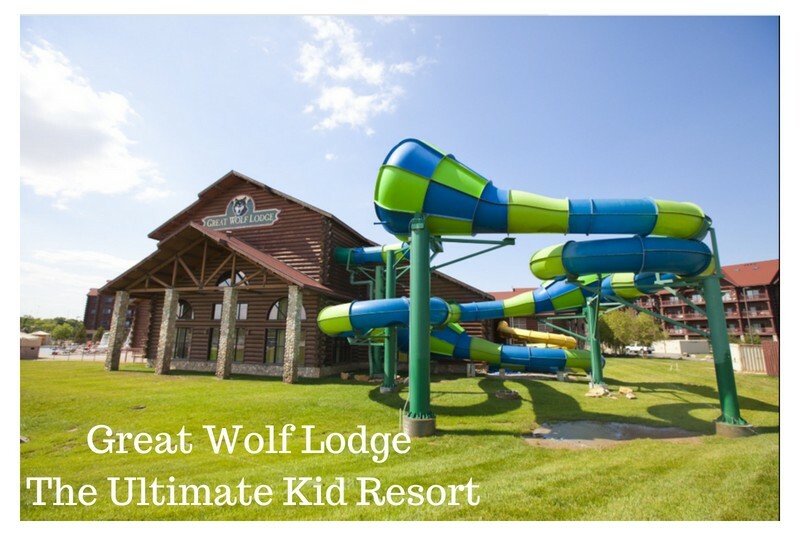 We really had a wonderful time staying at the Great Wolf Lodge and recommend it to families looking for that perfect one stop getaway no matter the season! A big thank you to Great Wolf Lodge for hosting in order to facilitate this review, all opinions are my own.